OLPC Afghanistan; now running for about the last year has a few technical updates we'd like to share with the community. Sustainable Working Human Power as you use the XO! Just this morning we tested the first prototype - the PAIWASTOON team that perform the technical implementation designed a new pedal powered machine that can power the XO as you pedal and use it at the same time. Even small kids (3/4th grade) can power it. 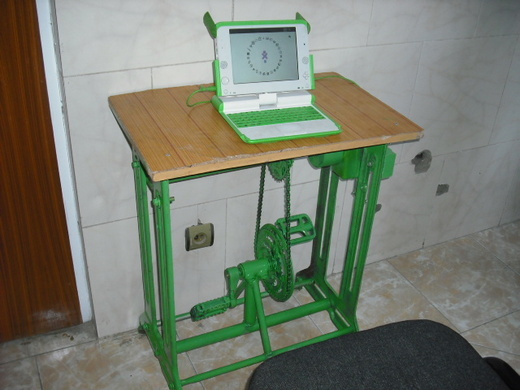 More photos / full specs will be published on the OLPC Afghanistan website. We are hoping to make this sustainably for XO / other power purposes in Afghanistan employing more Afghan staff. This should work fine with XO 1.5 as well! To make deployment simpler we have adopted the OpenWRT Freifunk router firmware. Each classroom contains two routers; one to provide connections to the laptops the other to mesh with the other classrooms and make a backbone. Instead of having to do cabling; just one box is put on the wall. It should also make it easier to extend the network outside the gates of the school. Right now 2,500 laptops are distributed to grades 4,5 and 6 in Kabul, Herat and Jalalabad. Now that we have a baseline system to work to deliver content libraries in limited connectivity environments (e.g. 64kbps connections or delivery on a stick) we are building the library to include more educational website copies that run offline (created through our previously released webdump based on httrack) and more curriculum / extra-curricular content. More details on all the above will be posted to the OLPC Wiki and the OLPC Afghanistan website shortly. Looks good to see the OLPC battery charger! You may or may not remember that people used to think the XO users would be able to get the FREEPLAY charger with XO's available in the USA. You can get more energy with Toe clips on your pedals! Did you do this in conjuction with the folks at the Jhai Foundation, who developed a pedal-power computer battery regenerator back in 2002-ish? If not, you should contact them... they'd likely be interested in this. Actually hadn't until now heard of the Jhai foundation... Just looked at their page. I will get in contact with them - definitely looks relevant. I notice their system mentions 25W - that would be quite difficult for a child to generate. Our testing found that a child (7-8yrs old or so) can generate about 11W of raw power with their feet against gravity, so by the time you convert that to electricity your left with about 6-7W; enough to run an XO but not much more. Just a thought. The old Singer treadle system provided more power than that mechanically. With a PM magnet alternator running at a higher speed one should more easily be able to create power more easily. I totally agree the treadle would work much better to produce the voltage needed. The pedal system requires more adjustment for individual use. Whereas with a treadle you only need to adjust the chair. WOW-they should have this in america so we can cure our obesity problem. very good for all the children addicted to computer games who are getting chubby. I don't have anything useful or wise to say except that the first thing I noticed about this charger is that the pedals the gears and the chain have the same green color as the keyboard. I hope that this will be maintained as it delivers a consistent marketing image for OLPC. Got me thinking that the poor afgan babies with their limited calorie intake have to power their way through their school days, then walk miles back to their homes dodging bullets too. In 2009 are there no better solutions like solar power . . . perhaps make the teachers pedal the darn things, maybe let the village hobos work up a sweat and pay them with free meals. I wonder who was the genius that thought of this whole mess. Consider that your kids need to concentrate on school work. We fat lazy Americans can barely multitask, texting and driving without crashing is quite the feat, and somone expects the kids are going to pedal their way into the worlds universities. As novel an idea as this would appear, its a sure way to make the program fail. What about inexpensive generators to charge backup dc batteries. There are few communities in the world making their own clothes so why not innovate to make life easier in other ways too. I guess you did not already know that generators that run on gasoline are NOT inexpensive! The hand crank from FREEPLAY simply is too tiring to continue using for a long time. The foot powered version is a much better option and uses the hand powered generator, which originally was provided to the school. I saw an article in my HomePower magazine that showed how they made a wooden wind generator. Just being released is the book, The Boy Who Harnessed The Wind. In it a 14 yr old from Malawi tells his story on how he made a wind generator out of trash he found, since he was not attending school. Build a wind generator, even if very inefficient and that would be the best idea to charge the XO from my perspective. Many schools in Afghanistan are only open a few hours a day, since the government does not pay the teachers sufficiently. Possibly, the XO there can be helping the students when they go home to continue learning outside of the classroom! We did try a treadle system in our first version - the problem is that one can only apply the force one way, and it relies on momentum to get back... Actually made getting the rhythm quite tricky. Gasoline / Diesel Generators - believe you me I know about the joys of working with those things.... Until Jan this year here in the capital Kabul we had power as little as 4hrs every 4 days from the city grid (now it's almost 24/7) Even if you forget the cost of purchase and fuel, the maintenance issue is where it really falls apart. Small generators (e.g. less than 10kW) out here die pretty quick given the amount of dust / lack of qualified mechanics. All of our generators that we have kept have wound up at the mechanics at least twice every six months. Wind power.... well I also saw that one... the issue is in a school we are talking about quite a lot of power (7W only usage nevermind charging per XO x 400+ kids)... Interestingly enough according to the Manchester Museum of Science and Industry 1001 inventions from the Islamic world the windmill itself was invented in what is now Afghanistan (then Ancient Persia). Again dust / maintenance is an issue with these things. The other problem is the reliability of wind vs. sun - and thus the amount of batteries you would need. 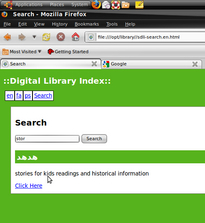 Anyhow perhaps we setup a page on the OLPC Wiki for discussion to make the next prototype? It doesn't matter how "efficient" a human-powered solution is, it hits an unmovable snag: XOs like to charge on a trickle, so you have to be at it several hours. Unless of course you have several XOs charging at the same time, kids and parents taking turns... Gets silly very fast. I have been onto solar for quite a while, see http://wiki.laptop.org/go/XO_Solar and http://www.olpcnews.com/hardware/power_supply/how_to_solar_power_xo_laptop.html but lately I am finding as maybe the most promising concept a gas turbine generator. Only one moving part: hence, once you have a good filter system, it should be basically less dependent on complex maintenance than any other generator option. Now, a disclaimer that very few people do in the alternative energy field: I have not tried it, so *I do not know*, though it powers, with political issues, one deployment in Madagascar. This disclaimer is important as we follow this kind of debate and initiatives: until the thing actually performs, in the field, regularly, take it as vaporware or at least as very experimental. It is great that a lot of people got excited about the XO because of the crank, but I personally find the level of almost purposeful (if that word can be said about many things that happen there) denial at OLPC official PR on that matter is an embarrassment. Since the XO likes a tickle charge, then shouldn't one be using a battery bank to trickle charge them? Getting a generator creating more electricity than the XO needs could be saved in the battery for another time. Sure, you get inefficiencies, but the power source could be charged when the power is created during the night when the XO's are not there. That is so cool to see. I didn't realize that you could get a laptop to run on pedal power. I should get one of those for my office, it might help me lose a few pounds while I work away at my desk all day. Actually you can get a low power laptop to run on handcrank power. ARM/TI OMAP(Beagle Board)/Some Atom Netbooks/Geode Touchbook can run on about 2 Watts total. All these processors typically run on deeply embedded applications. The Geode in the OLPC and the TI OMAP 3 Touchbook and Nokia N820 can go much lower and run Linux (as does the Beagle board). Linux with Sugar, Moblin, Android XFCE (Ubuntu Netbook Remix) are critical to the ability to run on the same amount of power as your typical flashlight 2 W. As we know it is a simple task now to buy a 1W output LED Flashlight with a handcrank generator. As for the issue with trickle charging it would seem to me the handcrank generator should have a supercap to help with this. Greg: yes to a battery, but we're talking raising costs, etc. Aw, cmon, Embedded, show us. Crank for 3 hours! I love your optimism, but trying to solve this with human power is fighting against basic laws of thermodynamics. I am not blaming you, you would expect that MIT professors would know as much, before sinking who knows how much money on Potenco and such. I think some of us were thinking of a sewing machine-type treadle which has a center-pivoting rocking plate operated by the feet with a rocking motion from the ankle. This allows both push and pull to be applied to the flywheel. This motion is also much more amenable to an activity like sewing (or typing), unlike the pedaling motion used in this setup. This mechanism was used for many years to power sewing machines which probably used considerably more energy than a laptop would, and is probably simpler to set up than even the pedals. It's mind boggling that you guys can take this "idea" seriously. Don't you just love the "portability" aspect of it? The truth is that countries who can't provide basic electricity to their children have no business spending their money on laptops. Where is you common sense? In a dusty corner of a Soweto youth centre, a stack of XO laptop computers is sitting idle. For the dozens of kids playing soccer outside, the laptop revolution is, temporarily, stalled. The computers were supposed to set the children free. Instead, on this day, they are gathering dust in a back room. A shortage of gas for the generator, a common occurrence in Soweto, has left the youth centre without any power or Internet connections. So the laptops are piled up on the floor to conserve their fading battery power. Actually perhaps we should think of laptop lids with a Amorphous Silicon Cell plastic Application. This would go over well with netbooks as well so could be a commercial success. For a $20 surplus roll up one 6.8W 12V I can charge a Ham Radio QRP Rig (Yaseu FT-817) and run it in receive. It has a Sanyo NiMH 8 cell pack. Question: Can we find a solar panel and NiMH batteries for us to adopt a OLPC per person for maintenance. For gods sake I have to pay $70 to insure Klien ISD's laptop for my kid each year. I thought that i had the treadle to power a laptop idea and *bam* the internet says no twice in one sitting. Take a look at someone who's put great use to the power generated by a treadle. I note the links to solar power posted here and appreciate the effort that went into the research. But practical solar power for small gadgets always comes back to relying on much large panels (30 Watt or greater) tied with deep cycle batteries for storage. The device in between them is a controller, which keeps the sun from overcharging the batteries by day and also prevents voltage draining off at night. A system capable of keeping several XO-1s charged and running could be assembled for several hundred dollars US. This is more cost effective and far better at energy management than the "One 5W PV Panel Per Laptop" approach. I actually find myself in rare agreement with Irv here . . . tying the XO-1 to a cast iron foot crank charger sort of defeats the whole idea of portability and it certainly is dehumanizing to expect someone to use a computer while peddling. Have OLPC bulk purchase seriously sized solar panels (not those wimpy 5W ones) along with good controllers and batteries . . . ship those out to remote locations and send along a technician to configure a solar power system on that sort of scale. I agree with you on most ideas. I do not consider operating a machine like a bike is dehumanizing. A diode can be used to prevent the batteries being drained, so a charge controller is not needed with a 5 watt solar panel. Who can wait 3 days to start using the XO when using a 5 watt solar panel? Using a 30 watt panel allows for the electricity needed in the Winter, so the charge controller is needed as a result! Hi Greg . . .
Perhaps "dehumanizing" is too strong a word, but operating the XO-1's sometimes twitchy mousepad and rubbery keyboard while peddling to keep power is certainly not what I would call an enlightening computer experience. I'd quickly want to go back to pen and paper. Yes, all PV panels up to about 15 Watts have diodes wired into the circuit. Even the bigger panels come with them wired in, but diodes can be removed if a good controller is going to be used. Depending on the particular controller, it may already have circuitry that makes a panel diode redundant. Yama's approach to solar is to mate each laptop to its own small panel. It's an interesting minimalist solar power idea, but is probably as frustrating to use as the peddle gadget. I think what Greg and I envision is more like a centralized approach to solar power . . . with larger rooftop panels, non-portable batteries and a controller to keep them happy. If done correctly, the laptop batteries will last longer (since they get a consistent regulated charge,) charge quicker and the solar gear ends up costing less per computer. "Yama's approach to solar is to mate each laptop to its own small panel. It's an interesting minimalist solar power idea, but is probably as frustrating to use as the peddle gadget." We could call it the worst of the good solutions. It works - most other options do not. Which might be good enough, but: You need sun - which can be a problem during the rainy season. You need sun, which means your XO needs to be plugged in 11 am to 2 pm to get its 3 hours charge - at the busiest time in terms of a school schedule. Having a battery would improve on this, but still someone will need to re-adjust the panel manually during the day so it faces the sun - and it adds cost, which might be OK, since a full-day charge might be enough to power two XOs, but beware: I have not tested it, so that might be vaporware also. Panels are fragile, unless you have them set permanently on a good structure (+ $), which also limits them being readjusted (thus less output) the first bad gust of wind might cause yours to fly away and break. Which brings us back to the fact that the really dependable solutions are more expensive! BTW, does this paddle thing recharge an XO completely, from red to say 95%%? how many hours of pedaling? This thread raises many questions about just one out of many issues that are plaguing the lil XO. I wonder what the cost is for the mechanical power solutions suggested so far, and the fact that only the free-play hand winding system is truly portable. The alternatives for external power are cute but add add to the cost in the sense that they are practical only if they allow for charging of spare batteries for hot swap replacement (if that is possible), charging of storage batteries for central dc power (can such a UPS be accomplished like they do in data centers), or directly powering the XO. One thing for sure is that poor power supply reduces the portability of the XO, thus reduces the value proposition of the olpc projects. The curious thing though, maybe its just me, for the success of the olpc projects/program we must not take away from the good experience for the kids by making them perform manual labor to get an education. The novelty wears out quickly and I can't possibly imagine myself completing an exam peddling up a storm as my computer beeps that's its losing power. As a former educator didatic learning is reduced when kids have a negative perception of the learning tools or experience. I am sure we can brainstorm solutions. Cost is always an issue, but considering the XO is not free, we can consider the lesser of evils so to speak. Each country or region has unique problems which means that the implementation plan has to be unique for each. - Remember, it's a system, not just a device. Ecosystems Nepal is the leader right now in pedal-generated village power (for LED lighting). They have designed their own recumbent pedal generator and use it to charge a master battery, which then charges small household batteries. An adult or an adolescent can provide sufficient power to charge several smaller batteries simultaneously. - The charging circuitry is, as noted above, a critical part of the system. Trickle charging uses one of the simplest circuits, but cannot take advantage of peaks of available power. Atmel has application notes describing microprocessor-controlled battery chargers and charge monitors , which may be of use in addressing the problem at hand. The XOs would still trickle charge, but from a master battery that is efficiently charged. - The cost of a pedal charger is better suited to a multi-laptop charging system than an individual use. - Whjile poor people may not have much money, they do have an economy, and electric power is a part of it. In Laos I learned that automotive batteries were used for household applications and that owners of trucks were paid to charge them. There was even a battery charging business down at the main road where power was available. People are going to try to adapt any charging system to charge batteries other than the intended ones, and the system along with its metering is going to have to adapt in order to be accepted and valued by the community. Kids are part of families, and families are part of communities. - In designing pedal-powered generation one should take careful note of the need for flywheels. Our family had an antique treadle-operated sewing machine in our basement, and it worked because of its flywheel (and, as noted, its center-axle treadle). I found out in Laos that a simple diode charger without a flywheel presented a radically nonlinear load to the pedaler which made pedal charging really difficult and frustrating. As I say, THINK SYSTEM. The original idea for pedal power came to me in 2002 as a backup solution for solar or wind generation, and moved to the fore because the system I was designing was intended to be used and maintained by schoolchildren. Other systems and situations may call for other proportions of technologies. There is nothing sacred about pedaling except that we know kids can do it and many of the components are widely available.